Anagi is my granddaughter who is all of three and a bit. Her recent arrival with her brother Ruby (adventures with Ruby is a story for another day) has improved my self-awareness beyond belief. I know of men objectifying women. But, Anagi chooses to objectify her thatha (that’s me). She climbs onto my neck, using my shoulder as a ladder step to reach some portions of the whiteboard to gaw (draw). “Gaw me a girl!” Anagi commands. I recall my childhood drawing skills and draw one. I start gawing — I mean drawing — a baby next to the girl. “Don’t you know anything thatha?” Her voice matches her expression. “Gaw a baby doll.” Now she speaks with her normal voice. She looks at me once more to ensure that I understand. I draw a baby doll in the girl’s hands. Anagi takes the marker back, draws a cloud and some rain. I draw an umbrella over the girl’s head. “You forgot the baby.” This is accompanied by a reproachful look. I dutifully draw an umbrella over the doll. Anagi steps back and looks at the drawing critically. She draws a strand of hair on the doll’s head saying — “It’s a girl baby, thatha.” Her voice is full of understanding and pity. “She is playing,” Anagi says. I draw a skipping rope in the girl’s hands. Suddenly her hands are spread wide. “I want toys, lots, lots, lots and lots of toys,” she says. 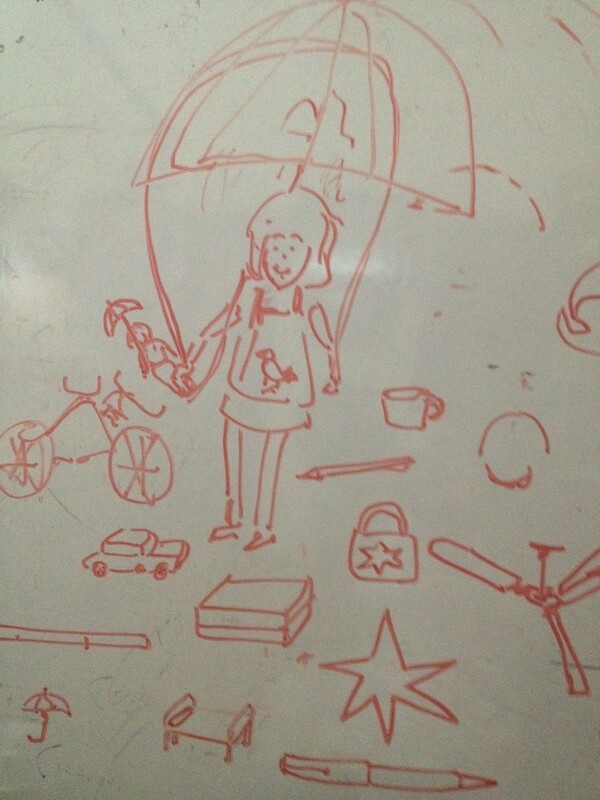 I draw a few toys including a bicycle. I draw as many ‘toys’ as possible, looking around the room for inspiration. “That’s not a toy. It’s a taar.” Anagi gives me a pitying look but makes no move to erase the star. If you liked the above, you may want to recommend it.